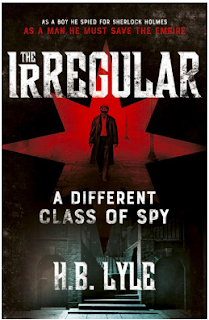 This week’s installment of Labour & Pop Culture is the 2017 novel “The Irregular” by H.B. Lyle. The setting is London in 1909 and the main character is Wiggins (I’m not sure we ever learn his first name). Wiggins is an adult version of one of Sherlock Holmes’ Baker Street Irregulars—a group of street urchins periodically employed by Holmes in his cases. The novel is historical fiction, mixing facts with fiction to create a fairly decent thriller. Wiggins is recruited by the government to form what will eventually become MI5 and MI6 (he becomes Agent 00). His task is to unravel a spy ring in a munitions factory that is leaking secrets to Germany. There is a separate plot line about Wiggins seek to avenge the death of one of his friends at the hands of Russian anarchists. Unions and workers form part of the backdrop of the story. London in 1909 is a pretty nasty place for the working class. There are rallies and protests (not covered by the press), with Marxist revolutionaries mixing with workers wanting 8 hour work days and decent pay and suffragists wanting the vote. The government’s response is to try to suppress demands demands made by the working class, often with the police. It is interesting that the workers are painted with a fair bit of sympathy by the author--particularly with regard to the immigrants who came to London from all over the world. Indeed, Wiggins is clearly of the lower class, in his appearance, manners, and values. Yet his main job is to save the empire—which treats his fellow workers so shabbily. It will be interesting to see how this conflict plays out in future novels. Last week, Minister of Advanced Education Marlin Schmidt and University of Alberta president David Turpin had a nasty spat. The exchange seemingly came in wake of the U of A’s announcement that it would be cutting 4% in spending and raising a variety of student fees. It’s concerning to me to see the president lining his own pockets while he’s cutting money being spent on classrooms and students. I've worked at three of the country's finest universities in three different provinces and this is the first time I have been personally and publicly attacked by a minister of the Crown. For the last year, we've been working with the government as they work to put in place legislation which is going to force boards to roll back compensation at universities for senior executives. So what we're seeing here is the minister using this as an opportunity to set this up for a public announcement [Thursday]. Schmidt took a hiding in the press for attacking Turpin. While I suspect there was more to this exchange than meets the eye, it certainly cements Schmidt’s reputation as a minister with a short fuse and no tolerance for institutions that defy or embarrass the government. Given that, it is interesting Schmidt has been so quiet about things at Athabasca University. Back in 2015, there was concern that the university would become insolvent and suggestion that being located in the town of Athabasca was a barrier to recruiting staff. This raised concerns about the university moving some or all operations out of town. We have stressed to the board and administration that Athabasca University has to maintain a strong presence in the community. I've made it very clear that our government wants to make sure that Athabasca University maintains a strong presence. 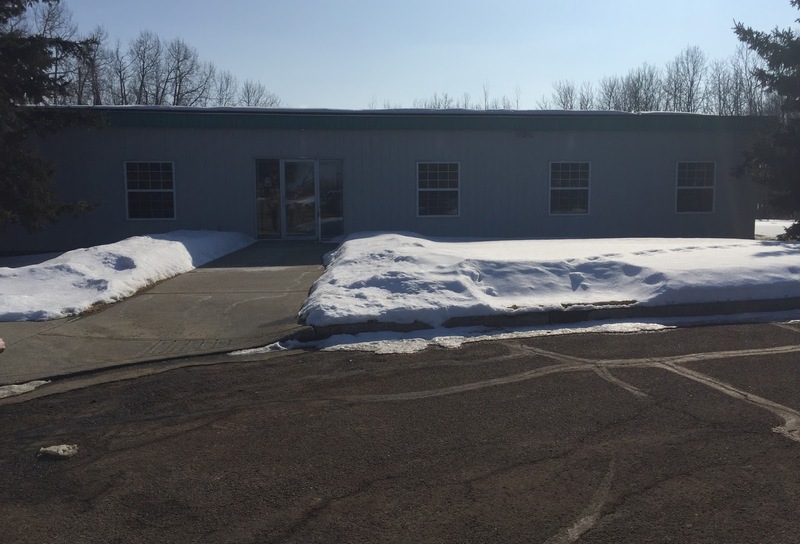 The resulting third party review of Athabasca University released last summer directed the creation of a fully costed report for an enhanced and focused presence in the town of Athabasca. There is no sign of that report yet and AU’s bevy of new strategic plans (with bumper-sticker management titles like IMAGINE, RISE, and EMPOWER) hardly mention the town of Athabasca. Professional positions leaving: In 2013, there were 125 professionals based in Athabasca. In 2018, there are 93. Professional positions at AU are among the best paid jobs in town. This entails a loss of about $3.5m to the local economy. This is a big issue in a small town. 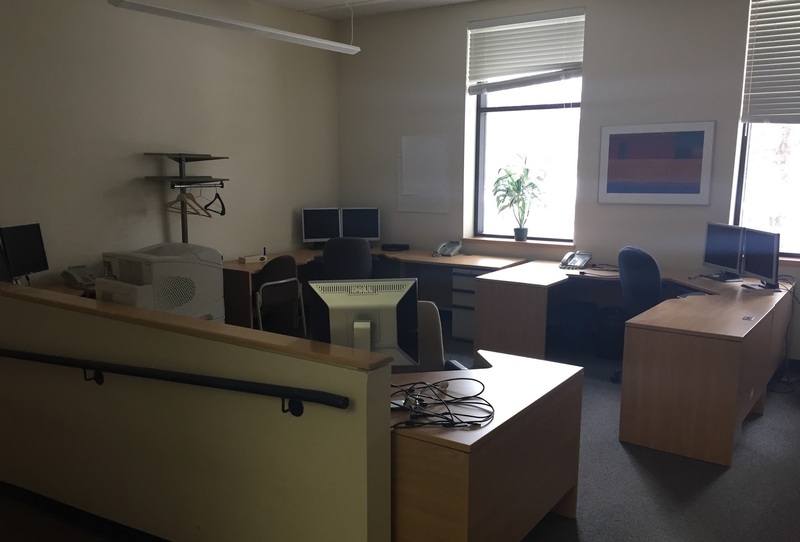 Executives leaving: In the past three years, the President, Vice President of Information Technology, University Secretary, Director of Human Resources, and Labour Relations Officer have all become based out of Edmonton. Traditionally these positions were based in Athabasca. They represent the loss of another $1m from the local economy. These departures also speak to the declining importance of the main campus. 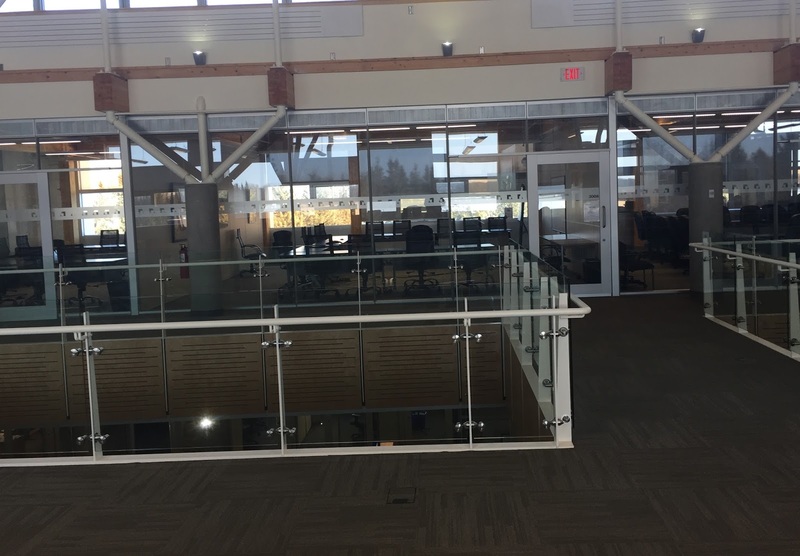 Bar on advertising jobs in Athabasca: The university is quietly forbidding most job applications from specifying a position is located in Athabasca. President Neil Fassina told the local paper that “this allows the university to cast a wider net to find better employees, who can then be persuaded to move to Athabasca.” There is no evidence that the university can't recruit to positions in Athabasca and clearly the university is not persuading new hires to move there. Despite the president’s assurances that all is well, the slow drain of good jobs from Athabasca a growing political issue. New Democrat MLA Colin Piquette narrowly won the riding in 2015 and did so in part based on concerns that electing right-wing candidates would mean the university would die out. Two weeks ago, he rather ambivalently commented in the local paper “Work needs to be done to ensure all the positions that make sense to be in Athabasca are here.” This is hardly a rousing defence of his constituent’s interests in good local jobs and will affect his chances of re-election in this traditionally conservative region. It also sets up a fight between the town council (which includes some staunch ND supporters) and the government. It will be interesting to see if Schmidt cracks down on Athabasca University’s quiet and gradual defiance of his government’s policy direction as sharply as he did on the U of A’s public defiance. If not, that may suggest that the residents of Athabasca need to turn up the heat on the government. 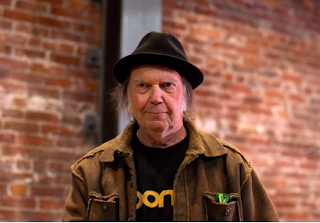 This week’s installment of Labour & Pop Culture is “Proud to be a union man” by Neil Young. On the surface, the lyrics are a pretty straight up expression of support for unions (specifically, the American Federation of Musicians or “A F of M”). The AFM represents about 80,000 professional musicians in the US and Canada. My google-fu was weak and I could dig up no bad blood between Young and the AFM to support that interpretation. I couldn’t find a video for this—just an audio over top some pictures. Being from 1980, it pre-dates videos. It is also a touch more country than Neil Young usually is. A few weeks back, I reported on an application before the Alberta Labour Relations Board (ALRB). The crux of the issue was that the University of Lethbridge was trying to compel the faculty association (FA) to negotiate two collective agreements: one for regular faculty and one for sessionals. This issue had come to a head because, in the spring of 2017, the government moved faculty collective bargaining mostly under the ambit of the Labour Relations Code. Most FAs are currently in their first round of bargaining in this new arrangement and both sides are maneuvering for advantage under the new rules. 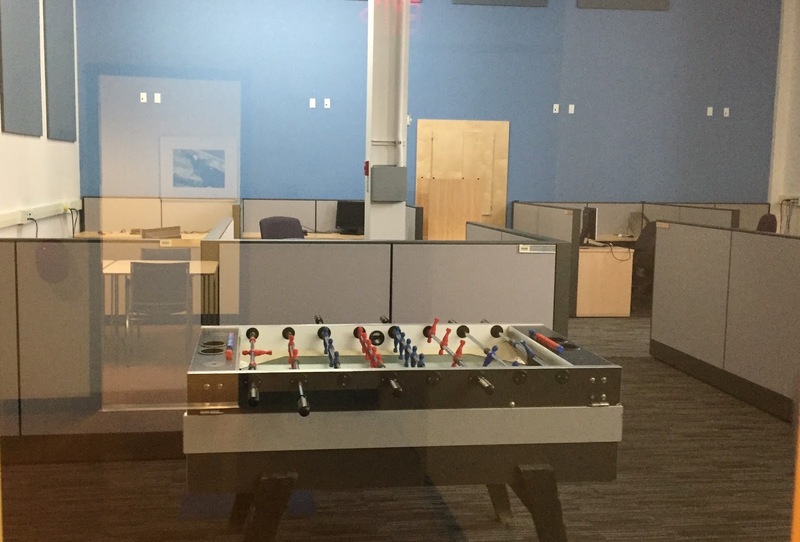 Typically an employer tries to carve up the workforce into multiple units in the hope of weakening the union’s bargaining position (and, specifically, its strike power). For example, the employer might go after the weaker unit for rollbacks and then use these rollbacks to try to whipsaw the stronger unit into a cut. Does the [Labour Relations] Code allow for or preclude the possibility of more than one bargaining unit for the academic staff and/or more than one collective agreement for the academic staff? The Board’s decisions was (1) there is a single bargaining unit, and (2) the parties can conclude multiple collective agreements (each covering a portion of the unit), but (3) neither side can force the other side to accept more than one agreement. In crude terms, the union won and the employer lost. The Board largely dismissed the university’s arguments, excepting the U of L’s argument that the Code allowed for the possibility of two collective agreements. This win by the U of L was undermined by the ALRB’s decisions that U of L cannot force two collective agreements on the FA if the FA does not want this arrangement (which was the whole point of the application). This decision has some other interesting points. Relying on the Interpretations Act, the ALRB largely rejected the unions’ arguments that the wording of the LRC (which is in the singular) preludes the bargaining of more than one collective agreement. It is interesting to speculate why the unions would argue a point so easily dismissed--perhaps there is a meta-game afoot here? The Board also rejected the argument that the authority of FAs is limited because of how they are created under the Post-Secondary Learning Act. Instead, the ALRB asserts that the 2017 amendments to the Code makes FAs bargaining agents. This means that FAs can, for example, represent workers other than those designated as academic staff members. One of the stranger aspects of this case is that U of L relied on internal staffer to argue their case. He was up against three union-side labour lawyers. The reports I have from the hearing are that this contest was (not surprisingly) a real mis-match. This choice of representation was a strange one, given that these early PSE cases are essentially setting the ground rules for labor relations going forward. The speculation I have heard is that U of L was trying to limits its legal costs. This may reflect the big chunk of change it would have dropped on last year’s Tony Hall discipline case. I have also heard that the government has been paying attention to the amount that post-secondary institutions are spending fighting their employees. And is pointedly questioning whether this is the best use of taxpayers dollars. It will be interesting to see whether such attention causes a change in the tone of labour relations or whether institutions just choose to continue fighting, but with one hand tied behind their backs. This week’s installment of Labour & Pop Culture looks at the recent Superstore episode entitled “Safety Training”. This episode centres on a minor workplace injury to a worker (Mateo). There were three main subplots of note. First, the store is keen to get Mateo to accept a small monetary payment in exchange for waiving his right to sue. The waiver includes a background check on Mateo (who is undocumented) so he declines the initial offer of $1000. This triggers an escalating series of offers that eventually reaches $50k. This fear-of-litigation dynamic speaks to a key reason why Canadian employers typically support workers’ compensation system: it limits employer liability for injuries. The historic trade-off in workers’ comp is that workers (usually) get stable, immediate and predictable compensation but give up their right to sue. Second, the series of safety incidents in the store results in the employer offering a refresher course in workplace safety. 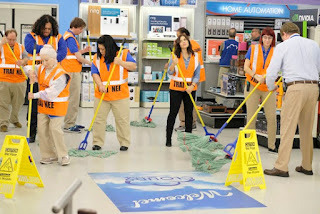 The training (e.g., how to mop) is completely demeaning to the workers. It also has no relationship to the incidents that caused the incidents. This kind of biting commentary of corporate training is one of the reasons Superstore is worthwhile watching. 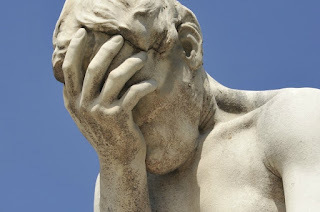 Third, there is a darker subplot wherein a previously injured worker finds out the employer lowballed him on its settlement for cutting off his finger. Seeing the potential for financial gain, the worker then commences trying to re-injury himself. In the end, the insanity of this behaviour becomes clear even to the dim-witted worker. This sub-plot is a sharp critique of the notion that workers will malinger on compensation. I couldn’t find a link to any on-point clips of the episode. But I did find this digital exclusive where Garrett developed a VR training simulation of how to close up the store. It is worth a watch. I spent last Friday in Calgary at a post-secondary labour relations conference that was organized by the Confederation of Alberta Faculty Associations. 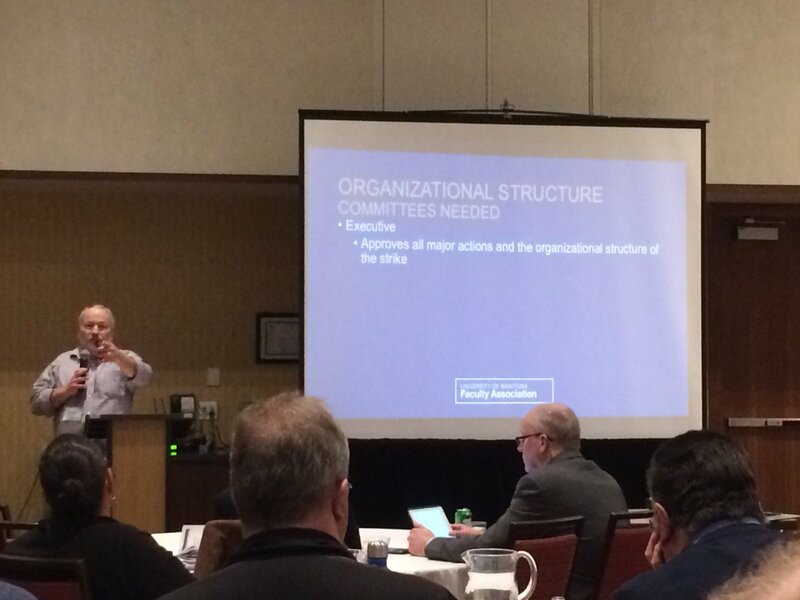 While the conference covered a wide range of topics flowing from last spring’s decision to move PSE bargaining under the Labour Relations Code, the sessions with the most engagement addressed work stoppages. Of particular interest was the session on the University of Manitoba’s 2016 work stoppage, which contained a significant amount of practical “how-to” advice. The side conversations—which were mostly about strike-lockout—were also quite interesting. The government is committed to stable and predictable funding for the Post-Secondary sector, in keeping with its election promises and previous actions: “Past behaviour is the best predictor of future action” one official said. The government provides operating funds to the University, we were told, but does not instruct management as to how those funds should be spent or how to bargain with its employees. The provincial government would look very unfavourably on any attempt by employers to force employees into concession through job action. On the first point, we’ll have to wait to see what the budget brings on March 22. The second point is probably correct in a narrow sense: Boards of Governors are charged with making due with whatever funds they get. Yet, the point about not telling Boards how to spend funds or bargain rings a touch hollow. The government has made it clear to its agencies, boards and commissions that it expects wage freezes. Subsequently, the unions representing nurses and health-science workers have taken zeros as well. Non-unionized government employees have also seen a wage-freeze. Given this, it is not surprising that at least one PSE institution has disclosed to its faculty association that the government (in a letter dated February 8, 2018) has notified the institution of the government’s expectations for the monetary outcome of the upcoming round of negotiations. The institution declined to provide the letter or summarize its contents, but I think it is fair to assume the crux was “get a wage freeze”. Indeed, lowering PSE wage settlements was one of the explicit goals of the legislation moving PSE bargaining under the Labour Relations Code, according to government MLA David Shepherd. The evidence suggests Shepherd’s assertion that arbitration leads to higher settlements is largely untrue. For example, from 2012 to 2017, most universities saw (non-compounded) wage settlements totaling between 8.0% and 9.5% (so 1.33% to 1.58% annually). Average annual inflation in Alberta during this period was about 1.3%. More interesting was the key high-side outlier: the Mount Royal University Faculty Association negotiated (non-compounded) increases totaling 14.2%. It is notable that MRU is the only university to have had strike-lockout in its contract and to have taken a strike vote (although, there were other factors at play). The final point made by the government officials was that “the government would look very unfavourably on any attempt by employers to force employees into concession through job action.” I would imagine this is true, politically speaking: alienating a key base of electoral support in the year leading up to an election is likely something the NDs want to avoid. Whether this has any practical meaning once negotiations start is a difficult question to answer. On the one hand, the officials asserted that the government does not tell PSE Boards how to bargain. So, presumably, an institution can do what it believes necessary (including locking faculty out) during bargaining to achieve whatever goals its has. On the other hand, the government clearly is directing bargaining outcomes (by setting wage expectations) and has given institutions a way to achieve them (via the power to lock its workers out). Perhaps the government would look dimly on a lockout, but might allow it to happen anyhow. To be fair, government is large and not monolithic. The government officials the U of L faculty association met with on February 26 may have had no idea about the letter that (presumably) other government officials sent to institutions on February 8 specifying bargaining outcomes. That said, this whole “who’s on first” routine (wherein the government is not at the table but seems to be calling the shots) is very reminiscent of the problems faced by Alberta’s teachers over the years. Specifically, teachers were forced to officially negotiate with school boards, but (since school boards relied on the province for money) the teachers were really bargaining with the Conservative government. This very dynamic was discussed explicitly in one of the conference presentations. The similarity between the ATA’s past problems and the current dynamics in PSE bargaining was the topic of significant post-conference discussion. 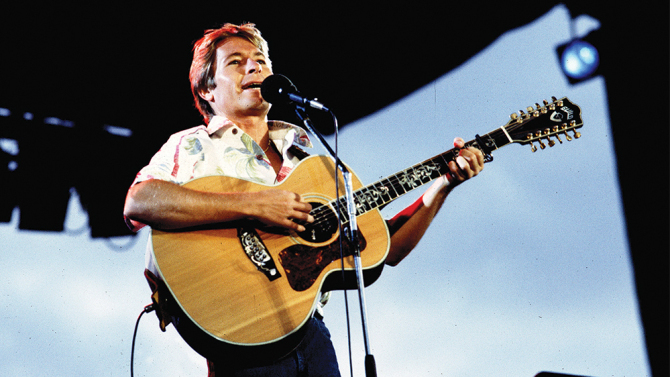 This week’s instalment of Labour & Pop Culture is “Goodbye again” by John Denver. This song picks up on last week’s “Leaving on a Jet Plane”. Denver noted that the songs really belong together, even though they were written about five years apart. The themes of stress caused by travelling for work are similar in both songs. This song, though, has some added depth in that it explores Denver’s reason for travelling. He also examines how this internal drive to perform in part makes him who he is and also provides a contrasting absence that makes the time they spend together the sweeter. It was a bit hard to find a video but this one from Japan in the early ‘80s really captures the honesty of his voice nicely. The Journal of Rural and Community Development has recently published a paper entitled “Understanding the absence of unionized workers in Alberta, Canada”. The paper is an open-access publication so you can download it in its entirety for free. This paper spatially located 333,881 unionized workers in Alberta. As Table 1 suggests, a disproportionate percentage of unionized workers are found in the province’s seven urban centres. Overall, urban residents are more than twice as likely as rural residents to be union members. Further, most unionized rural workers are found in large, public-sector bargaining units. Unionized rural workers in the private sector are typically employed by a small number of large employers with industrial-style operations, such as meat-processing plants, refineries, mills, and mines.  a regulatory structure that impeded organizing. The most interesting explanation centres on rural workers perceiving unionization as a less effective way to improve their lot in life than the other strategies available to them. . This week’s installment of Labour & Pop Culture looks at “Leaving on jet plane” by John Denver (although the Peter, Paul and Mary cover of the song is the most famous version). The song chronicles the emotional strain associated with migrant work (presumably Denver’s travelling as a musician). While there is a growing body of literature about the shift of social reproductive responsibilities and family strain caused by employment-related geographic mobility, the emotional stress on such workers is under-researched. There are lots of versions of the song available. I picked this one because it is an interesting duet with Cass Elliot from 1972 (songs starts at 1:55). Her voice immediately situates the song in the late 1960s and early 1970s.